Parker PGI’s wide variety of 2-Valve Manifolds permits the user to select and hook-up to virtually any pressure transmitter, gauge or switch. The controlled vent provides the option of venting to atmosphere or piping to a collector, depending on the media. PGI’s selection of 3-Valve Manifolds permit the user to select and hook-up any transmitter. 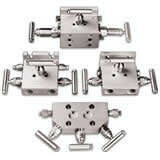 Several 3-Valve Manifold styles are available with controlled vents for use where venting to atmosphere is not permitted and piping to collectors or vessels is required. PGI’s 5-Valve Manifolds permit the user to select and hook-up any chart recorder, transmitter or electronic flow meter (EFM) for gas applications. They also feature our WIDE Pattern™ technology, a unique configuration for “no finger pinching” operation of all five valves. Parker’s Versa-Mount bracket allows the easy mounting of most 2, 3 and 5-Valve Manifolds to a 2” pipe stand or wall-mounted application. All Manifolds feature PGI’s PTFE Pressure-Core® Stem Seal with 5 year warranty as standard, with the LoneStar™ design with PTFE packing also available. All Manifolds are also offered with our Low-Torque™ Grafoil® packed stem seals. To answer customer requests for a lower stem handle turning torque, PGI developed a proprietary assembly technique to lower stem torque by 50% which increases ease of operation, and therefore reduces stem abrasion and stem damage from over-torqueing. The Low-Torque™ Grafoil® packed stem seal reduces packing adjustments and the associated maintenance costs, while extending the service life of the Grafoil® packing. In addition PGI Manifolds are available with a bonnet handle lock-out that prevents unauthorized cycling in either the open or closed position, or an anti-tamper bonnet that allows the bonnet stem to be placed in any position before removing the handle. OS &Y bonnets are also offered. Orifice Size .136" | .187" | .250" | .375"